We had few members in attendance for the January meeting. This was partially due to the bad weather and partially due to family matters. Five members, a guest, and our speaker, but we had a great time! Because Angelica couldn't make the meeting, I took over Social Media and Jessica lead the meeting. Next Challenge – Make a Fidget Quilt to be donated to a Memory Care Facility for Dementia patients, they are due in June. You can read the post here. 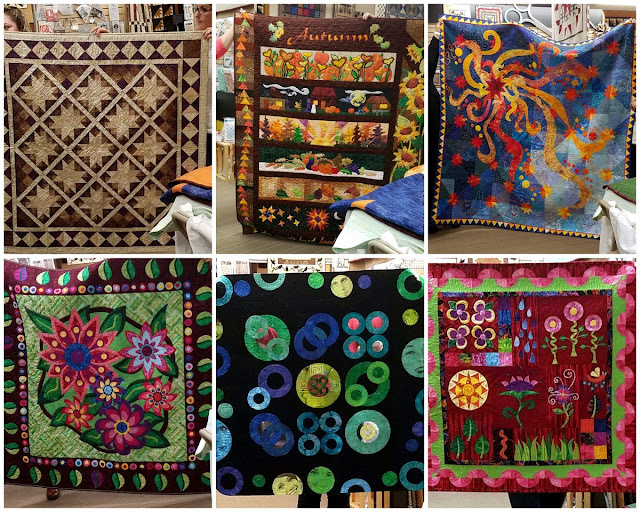 The March meeting will have a Sew-In for making placemats to be donated to Meals on Wheels, so bring your machine and tread. 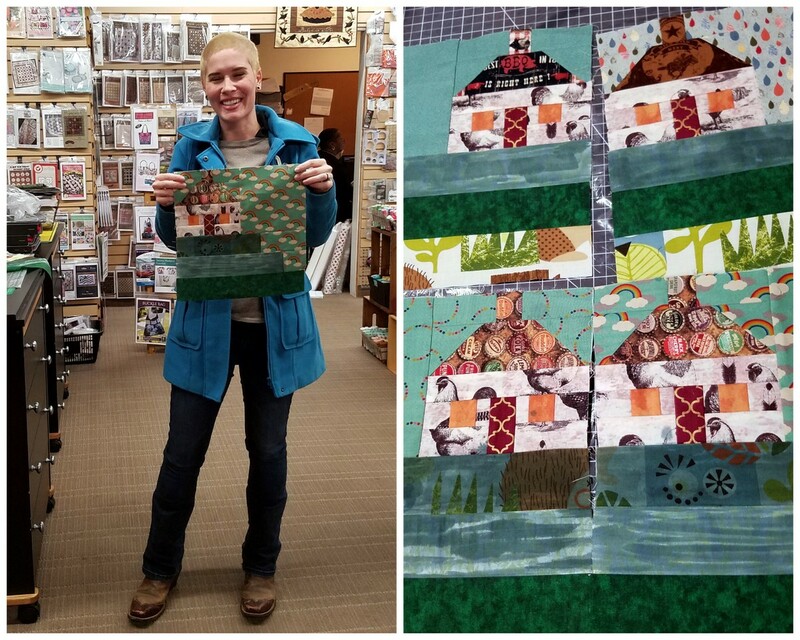 We will use some of our BOM blocks for this project, plus leftover fabric from our Quiltcon Challenge quilt that we abandoned. Something new ~ Bring a door prize for the meeting of your birthday month. Bring something that you'd like to win. This is voluntary, of course. Suzanne has a sign-up sheet for the BOM demos and Demonstration Volunteers. 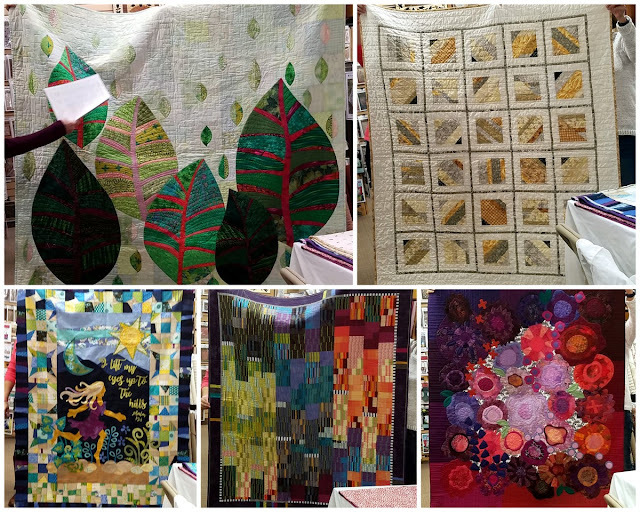 Charity BOM: if a member doesn’t participate by making BOMs, assembling, quilting or binding quilts, require a finished large lap-size quilt, approximately 58 x 72”, to be donated by the November meeting each year. 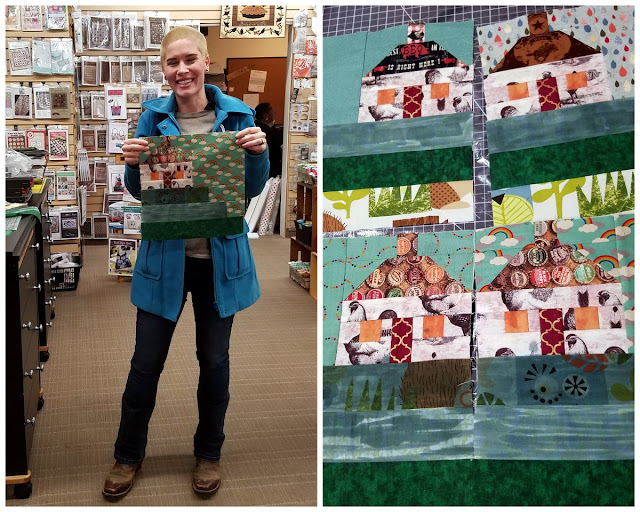 Taylor has started the 2019 Sew Hometown BOM project, from the calendar she received at the December meeting. She made the first four blocks for January and explained how she dyed some of her fabric because she didn't have enough solids for the project. This is our BOM, due in February, the tutorial is here. The name of the block is Woven. Door Prizes: We had 3 door prizes and no one put a ticket in one of the buckets! The other two prizes were won by Taylor, the Primitive Gatherings gift card and some FQs! She attempted to negate the 2nd win, but since she never wins, we pooh, poohed the idea. Yay, Taylor! Now for the main part of the meeting. We had a special guest, Linda Evans, she's a local quilter from Murrieta. 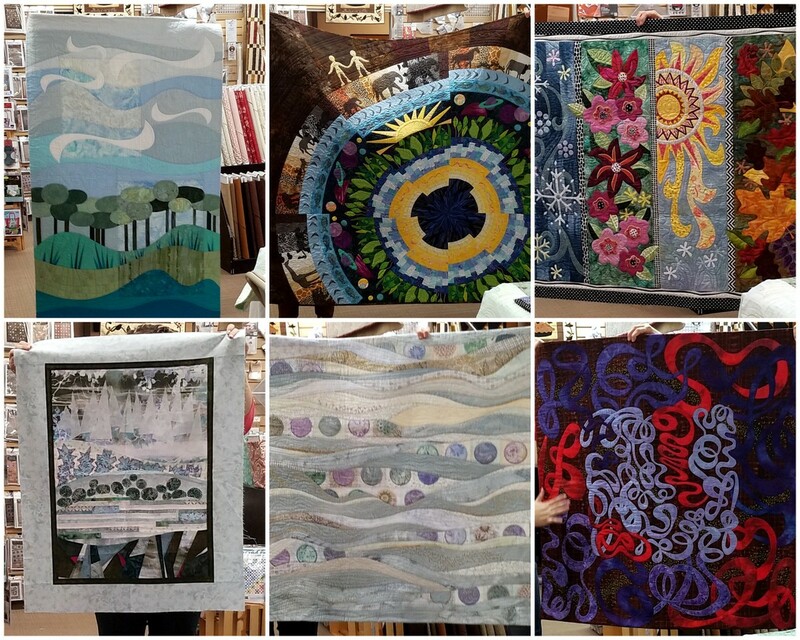 She talked about her quilting journey and how her quilts have changed over the years. She was a delightful woman and speaker; we learned a lot and a lot of fun learning from her. She showed us 19 of her wallhangings, plus some really small quilts. You can check her out at @qultart and @stitchngrow on IG. She also has an Etsy shop. These are quilts from 2005 to 2009, Stars, Autumn, Let Your Light Shine, Garden Groove, Friends & Family, Garden Groove. The next batch is from 2001 to 2015, Lovely Day, New Beginnings, Special Occasions - Seasons, a flimsy form a workshop, Easy on The Eye, Drift. 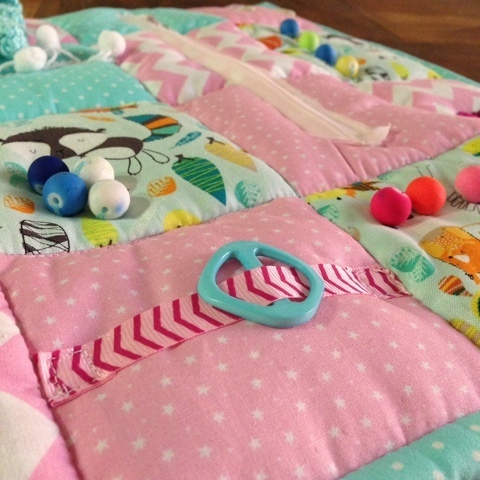 The names of these are So Green, Cuddle Quilt, flimsy - Wonky Themes, Detour, Stitch and Grow. Thank you, Linda Evans, for bringing all these beautiful quilts to the meeting. Jessica will be in charge next month, I will be in Nashville, volunteering at Quiltcon. 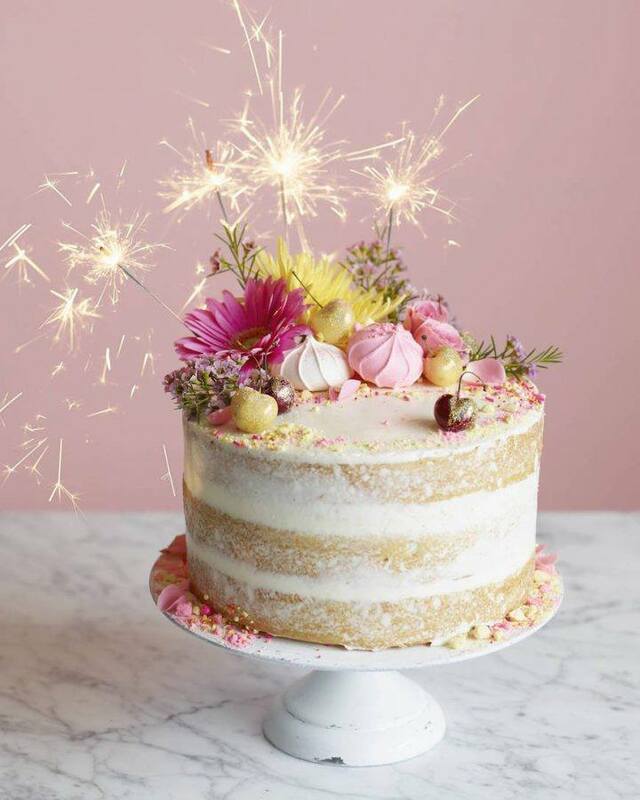 December 2018 Meeting / Christmas Party!